The time has come: I'm well aware of my shortcomings...but now Bug has gotten old enough that she can call me out on my faults too. Friday was a snow day in NYC and I decided to try Compost Cookies, which I heard about from Amateur Gourmet. When I told Bug about my intention to bake cookies, she said (verbatim): "Mommy, you can be my sous chef because you can't bake and I can." Oh, dear. My reputation had preceded me. Can you tell? They were flat as pancakes and I have no idea why. Adam (my husband, not Amateur Gourmet) thought that it was because I was using older baking soda. Do you bakers out there concur? Where did I go wrong? But, daaaaaamn. The flatness aside, these are incredible and MY kind of dessert. Bug and I added crushed pretzels, crushed potato chips, dark chocolate chips, coconut, and some leftover sprinkles from an earlier baking project. Oh, and we also added about a tablespoon of peanut butter chips I found at the back of the cabinet that hadn't gone bad yet. Really, the sky's the limit. You could throw in oatmeal, raisinettes, nuts...anything! But what creates magic is the interplay of sweet and salty. It's dessert gold, guys. Gold. I'm going to be a lazy blogger (oh, shhh, you love it and you know it!) and only link to the recipe. Here it is, courtesy...of all things...Live with Regis and Kelly. Lordy. And here's one more thing before I close this out: STAND MIXER. I've never owned one and never felt like I needed to. When the Soul Twin become a full-blown veterinary cardiologist (for real! ), she told me she was going to buy me a stand mixer. She swore that the only reason I wasn't a baker was because I didn't have one. Yes, I rolled my eyes at her. Then I said, "Where the hell would I fit a stand mixer in this kitchen?!?!" She looked around and said that she saw my point. Crappy NYC kitchens. BUT...this recipe made me rethink my stance. I used my hand mixer. And you'll see from the recipe that you need to use your stand mixer for TEN MINUTES. My arm nearly FELL OFF. Not to mention that my batter failed to double in size like the recipe said. Hey, maybe that's why my cookies were so flat... Hell, this is exactly why I loathe baking. Why is it so complicated?! If the baking doesn't pan out, I can use this for sausage and pasta! Now THAT is what I'm talkin' 'bout, Willis! Eat, drink, and keep trying...I guess. I think that I have agree with you on the stand mixer. Ella came home from a play date with cookies that blew our minds (and waistlines). The only difference that I could find in what she did was that she used a stand mixer. They had a fluffy quality without being cakey (a big yuck in my book)but were still chewy. We, too, have nowhere to store a stand mixer, but a girl can dream of ample counter space, eh? I love any baked item that can involve pretzels. I am going to try these for sure! I have a stand mixer and love it. Not sure why the cookies were flat, baking soda would have to be pretty old to not work. Eggs should have given some fluff as well. These cookies look yummy, fluff or not. Soooo making these this weekend! 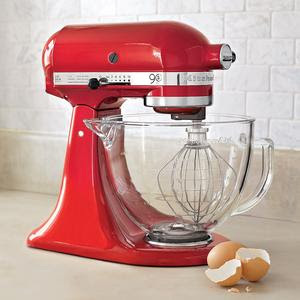 And it is clearly time for you to prioritize your counter top for some Kitchen Aid Mixer love. Hand mixing for 10 minutes... what is this, the dark ages?? Yay red! LOVE this post - I'm inspired. And I've been debating the stand mixer too. Maybe we can buy one together and have joint custody? Though I guess the only thing worse than finding space for it in a NYC kitchen would be lugging it on the subway . . .
Rebecca, that's tempting! Can't you just imagine the look on the subway riders' faces when you get on the train with a KitchenAid? Classic NYC moment! Brenda: exactly. I think my lack of stand mixer meant that the eggs didn't get fluffed as much as they should have. My arm didn't really do the necessary work. 2010 SLJ Battle of the Books!! !